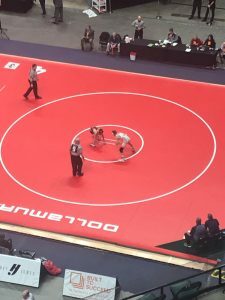 New Palestine sophomore Christian White dropped an 8-1 decision to Oak Hill’s Harper Dedman Friday in the first round of the IHSAA wrestling State Finals. After surrendering the first takedown, White got an escape to trail 2-1 after a period, but Dedman was able to score four points in the second and add two more in the third. White finishes a stellar season with a 33-6 record. Christian White wrestles at Bankers Life Fieldhouse.